They live just yards apart, were married within weeks of each other and, between them, have clocked up 180 years of wedded bliss. Today, three Northumberland couples will celebrate their diamond wedding anniversaries together. The Hugheses, the Parkins and the McLauchlins, all of whom live at Old Station Court in Darras Hall, are holding a joint party to mark the triple-occasion. Tom and Joan Hughes, both 88, have lived on the row of 20 plush bungalows for 10 years. Joan and Arthur Parkin, 86 and 89, moved in 16 years ago, and John and Connie McLauchlin, both 84, have lived there 17 years. The two Joans are long-term friends through their WRVS days but the rest only got to know each other when they became neighbours. 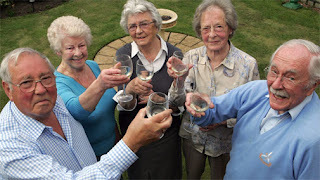 Now they all enjoy sharing a drink, and throw parties for the street's 25 or so residents for birthdays, wedding anniversaries, Christmas and New Year, although they joke that the days of 5am finishes are behind them. Keeping up the tradition, the whole population of Old Station Court will gather at the United Reformed Church in Darras Hall this afternoon to celebrate a combined 180 years of marriage. Partygoers will be treated to an exhibition of memorabilia about the couples and the history of the street. Putting their achievements into perspective, John said: "Someone quoted out of every 422 (couples) only one reaches this stage, only one couple survive." As for why they have all enjoyed such long lasting marriages, Joan Hughes jokes they "cannot afford to separate." Connie added: "I think we just get on with life and we did not think of having affairs or we did not have the time or the money or whatever you have to have! "We have all enjoyed life and we are blessed because we have got good health. That is what it is all about. "Our grandchildren think it is amazing that we have got to this." John and Connie, both from Newcastle, tied the knot on April 15 in Newcastle's St Mary's Cathedral. John worked as operations director at Newcastle Breweries for more than 40 years, having two retirements, and also served in the navy from the age of 16. Connie is a former dancer, telephonist with the Women's Royal Navy, supervisor at British Home Stores and also worked at the Ministry of Pensions. Tom and Joan, who hail from the Midlands, were married in Birmingham in a joint ceremony with her twin sister Margaret on June 11. Tom was in the RAF in the Second World War and was shot down while flying a Spitfire over Italy in December 1943. He was a prisoner of war in Germany for a year and a half and later worked in engineering. Margaret was a school PE instructor and received the MBE in 1983 for her 52 years with the WRVS as county organiser for Northumberland. Joan and Arthur, also Tynesiders, married at St Gabriel's church in Heaton on June 12. Joan was in the Land Army and worked in advertising. Arthur served in the RAF and worked as a civil servant. He suffers from Parkinson's Disease and was in hospital yesterday but it is hoped he will be allowed to attend today's celebrations.